November 7, 2017 by Ryan Niemiec, Psy. D.
What if we could use the principle of psychology not just to treat problems and shortcomings, but to reach our greatest potential? What are the best qualities of individuals and communities, transcending history, place and culture? And how do we stay conscious of, and use, these virtues in a chaotic, confusing world? We spoke with Dr. Ryan Niemiec, education director of the VIA Institute on Character, about developing ways to measure how communities and individuals succeed. This program is part of the project “Science Education for Jewish Professionals,” a series of webinars run in partnership the American Association for the Advancement of Science Program of Dialogue on Science, Ethics and Religion, in partnership with Sinai and Synapses, hosted by Clal – The National Jewish Center for Learning and Leadership, and funded by the John Templeton Foundation. Geoff Mitelman: So welcome, everyone, to the second of two webinar series that are being run among Sinai and Synapses and AAAS Dialogue on Science, Ethics and Religion, and Clal, the National Jewish Center for Learning and Leadership, and we’re thrilled that you all have joined us in this webinar about Judaism and science and human flourishing. My name is Rabbi Geoff Mitelman, I am the founding director of Sinai and Synapses. It is my pleasure to introduce Dr. Ryan Niemiec, who is somebody I have had an opportunity to learn from and with through Clal’s Rabbis Without Borders program. Dr. Niemiec is a leading figure in the education, research and practice of character strengths that are found in all human beings. He’s the author of several books, including “Character Strengths Interventions“, “Mindfulness and Character Strengths: A Practical Guide to Flourishing,” “Movies and Mental Illness: Using Films to Understand Psychopathology” and “Positive Psychology at the Movies.” He is the education director of the VIA Institute on Character, a global nonprofit organization in Cincinnati that advances the latest science and practical applications of character strengths. And so, Dr. Niemiec, I’m thrilled to be able to turn it over to you to be able to share a little bit about your work and character strengths, Judaism and the science of human flourishing. Ryan Niemiec: Thank you so much Geoff, and really just it’s such an honor for me to be here with all of you. And so I just really want to thank all those people that have been part of bringing this together, Geoff, you and Rachel, at Clal and Sinai and Synapses, and the whole DoSer team, Warren and Curtis and Se, just so much great work with your collaboration, and I’m just really excited to have a small part of that. And Geoff, as you and I were just talking about before we started here, you know, this work with character strengths and flourishing and positive psychology, these topics we’re going to getting into today, are really becoming hotter and hotter topics here in the world. And you know, as the science of human flourishing continues to expand, people from various walks of life and various professions are becoming interested in it, and so it has – it’s really not a surprise that it would capture the attention and the interest of various rabbis and students and people from other religious thoughts as well. So it’s really exciting to begin to be thinking about the intersections with Judaism and really how this can contribute to stronger congregations, stronger rabbis, stronger people in general. So I’m excited to really be here, to offer a very brief and general overview of some of the science going on with character strengths. And I’ll just kind of rely on people’s questions to kind of guide me to other kinds of scientific areas or findings with character strengths or best practices, this kind of thing. So I’ll hit a little bit on that, and a little bit of where this work comes from in the field of positive psychology, a little bit into flourishing, little bit into mindfulness. I was also asked to to make the intersection a little bit with technology, so I’ll be happy to do that. I’ll tell you a little bit about the VIA and Clal project with rabbis, which is very exciting – I think everyone will want to hear about. And then along the way, offer some tips for, you know, for just how might we best consume research, how do we consume science. So that’s the agenda, a lofty agenda, but we can do it. So let’s go ahead and dive in, so. So this work in character strengths come squarely out of the field called positive psychology, and simply put, positive psychology is the science of well-being. In the late 1990’s, the president of the American Psychological Association, Martin Seligman, really framed this field under three areas, and he framed it as – it’s the scientific study of positive subjective experiences, which is things like positive emotions, positive traits – which is another phrase for character strengths – and positive institutions. So what really constitutes an institution that’s positive, or how do we create a virtuous organization? So this was the original definition of the field in the original framework. It has since, of course, broadened and become a lot more than just this, but this was the original piece. And really it came from Marty and other people’s observations of psychology and related fields, that psychology had traditionally, over the previous hundred years or so, been very good at studying what’s wrong in life, very good at looking at deficits, helping people to correct deficits. Very good at helping people to overcome addictions and/or better manage them at least, or to deal with depression and anxiety and all sorts of problems. But psychology had not offered as much, from a scientific and practical point of view, on what’s best in human beings, what helps to create a flourishing life. And so really, before positive psychology came about in 2000, the field of psychology was what Marty called “half baked.” So that’s the image of the bread here – sort of a half-baked loaf of bread. And that we weren’t really working with the full human being from a scientific perspective, or from a practical perspective, a helping-relationship kind of perspective. So that’s one of the reasons why positive psychology came into being and why it was so important, to really round out the whole person, that we need to look at both of life. And by the way, with the positive side of life, it’s not being unilaterally positive. It’s saying “how can we use positive emotions, character strengths, and so on, to be able to help us with life’s suffering, to help us with depression, to help us with problems and difficulties as well?”. So it’s not just studying flourishing in and of itself, it’s within multiple contexts. So that’s this field, and so one of the biggest areas that has come about, and probably still remains the biggest project in positive psychology that came about, is the VIA classification, which is what we’re talking about here today. So the VIA classification of universal character strengths came about – it was a three-year project that started around the year 2000, and it was initially started by Neal Mayerson, who’s my boss and the chairman of the VIA Institute, [and] runs a family philanthropy here in Cincinnati, and he connected with Marty Seligman around positive character, and was saying “gosh, there’s a lot here, what can I do to help?”. And the two of them initiated a number of scientific meetings in early 2000’s, and really what scientists came to understand is, we don’t really have a common language for understanding what’s best in human beings. There’s no common language to dialogue about this kind of stuff. So they looked to all of the world religions. They looked to some of the most remote cultures on the planet, so speaking with the Inuit people in far northern Greenland, and the Masai tribal people far off the tourist circuit in Kenya. And they were wondering “What is best in your culture? And do you have these particular strengths?” and what they were finding across philosophies, across religions, is that there was great parallel across these experiences, and from those parallels of six virtues, wisdom, courage, humanity, justice, temperance, and transcendence – I’ll show those here in a moment – they then looked more closely, to derive 24 character strengths, which they use particular criteria to determine what are the qualities that make up wisdom, or courage, and what constitutes one of these positive traits that are in human beings? And so they use these these criteria to establish that. So character strength has to be something that’s measurable, and has to be ubiquitous. So it can’t be bound into any one culture, so it can’t be something like achievement or ambition, since those are more traditionally Western-bound traits. So the idea here is that this wouldn’t be a Western classification, but a universal classification. A classification that describes what’s best in any human being. And so, these were some of the other criteria that they looked at. Is the quality, the strength, trait-like? Is it culturally valued? Is it fulfilling? And so on, down the way. And what this amounted to, through this three-year process, is this common language of strength, so these 24 strengths. You see the six universal virtues that cut across religions and philosophies on the left column, and then the 24 strengths that met those criteria to the right there. So this became – really, for the first time in history, we now have a common language, a common language for understanding what’s best in human beings. And I was a practicing psychologist in St. Louis, Missouri, I’m in Cincinnati here now, where the VIA Institute is, but I was in St. Louis for a number of years, about eight years or so, seeing clients. And before this classification came about, I was doing the traditional approach of helping to diagnose and treat the “what’s wrong” parts of people. And I would still – I always had wanted to be able to look at what’s right, to speak to what’s right, but there wasn’t this kind of cohesive language. I would kind of find myself repeating myself, and hemming and hawing, like, “Oh, well, you’re a good person, and you’re a nice person, you seem to work hard,” you know, I didn’t have, sort of, this kind of language to it to be able to go by, that had this scientific underpinning. And so when this came about, then, it helped to really kind of shift my thinking, not only to take a more strength-based mindset, but also in how I worked with people as a practitioner, as an educator, as a teacher. So if we summarize here – so let’s put what I’ve said so far together, along with what the research has been saying since this came out. So this came out in 2004, so about 13 years ago. Let’s put all that together into a definition for everybody. So we might think of this work like this: that this VIA classification of the 24 character strengths and six virtues really represents a common language of personality traits. So these are traits that are part of our personality, part of the core of who we are, and really, then, they reflect three things, or they lead to three things, they’re connected with three things – identity, positive outcomes, and collective good. So the first identity – so these 24 strengths reflect who we are. This is kind of identity psychology. You know, when you strip away everything else about you, and you really get down to what matters most, most likely it’s these 24 strengths. Or you might say a different word or two, but they’d probably be synonyms to these strengths. Not that we don’t have many other good parts to ourselves, but this would be that the central part. So that’s one piece – they’re part of our core. Another part is that they lead to positive outcomes. So we now have hundreds of studies, that have come about just in these last 10 or so years, that have shown that these character strengths are connected with various positive outcomes, whether that’s greater well-being, better achievement, better health, greater intimacy in relationships, and so on. And then third, these character strengths contribute to the collective good. So these can be seen as, sort of, the ingredients of creating a better society, or a stronger family, or a stronger congregation, or a stronger community. You know, and just the thought – you know – the thought exercise that you might put to yourself with this is: is there any one of these strengths that you wouldn’t want in your family, that you wouldn’t want in your congregation? So, it’s an interesting thought experiment. What would you take out? And I’d be surprised if anybody could pick any of them that they wouldn’t want in their spouse, they wouldn’t want in their family, they wouldn’t want in their congregation, that they wouldn’t want in their city, their country, and so on. And the reason for that is because, again, they’re universal, they’re all valued. They all have different purposes, and they all can create different things, each of these strengths. You know, perseverance and self-regulation, are kind of linked more with achievement. Obviously, love and gratitude and kindness are going to be linked more with relationships, but they’re all valued in different ways. So this is kind of just giving you a little overview of this common language. So then, stepping back then, so now I have been sharing a little bit about the VIA classification – that’s a picture of the 800-page book that Chris and Marty and the 55 scientists wrote in 2004 that really summarized everything I’ve just said, and goes through everything you’d want to know about any of the 24 strengths in a very scholarly, academic way. And this was a new science that was emerging. There had never been a science of character strengths with this kind of depth before, anything even remotely close to it. So any new science that has a classification like this also needs a measurement tool. So then they were also charged, you know, Chris Peterson and Marty Seligman and his group, with creating measurement tools. So they were asked – they were charged to create an adult survey that measures these 24 strengths, and to create a youth survey that measures these 24 strengths. So again, they produced that, several iterations later, they produced that, in the early 2000’s. And so now anybody can go and take it. I think maybe most of you have taken the survey, if not, you simply go to viacharacter.org. And it’s free, and you get a – you take this psychometrically valid test measuring these character strengths, and you get immediate results of a rank order from 1 to 24, of your highest strengths to least strengths. And if you’re a youth between the age of 10 and 17, then you would take that one, otherwise you take the adult survey. And this, you know, this survey, has been so popular, it’s actually been taken now by getting close to six million people. It’s reached every country around the world, it’s now been translated – going through a rigorous process to become a translation – it’s been translated now into 39 languages. Hebrew is one of them. And it’s actually growing in popularity. So in the last five years, there’s been a 40 percent increase in people coming to the website, and taking the survey, and so on. 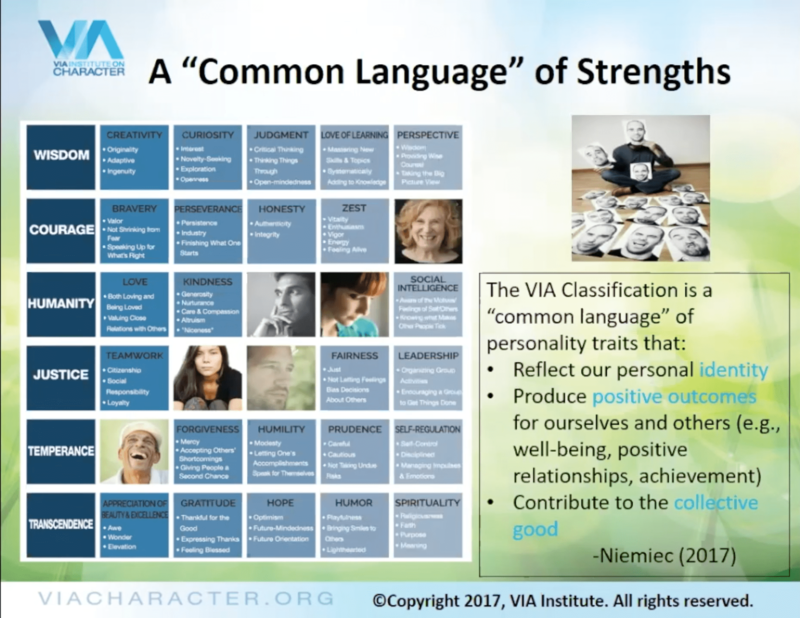 We get about 10,000 people per day on the VIA website trying to learn about character strengths, and kind of deepen their knowledge of the science, deepen their knowledge of practices, watch videos of people using it, practicing it, and so on. So that’s the VIA classification and VIA survey, and so all of that is housed under the VIA Institute. And so you see a picture of where the VIA Institute is located, in downtown Cincinnati, at the top of one of the buildings, in the skyline of Cincinnati. The VIA Institute on Character is a nonprofit, so it’s a nonprofit organization that has a very clear mission. It’s what you see on the screen there. It’s “advance the science and advance the practice of character strengths.” That’s what it is. Now, it gets very complicated when you unpack that, because there’s not one, two, 20 or 100 ways to do that, there’s infinite ways that you can advance the science and practice. But everything that I do – so, presentations I give, keynotes I do, technical reports that I create, meetings that I have, books that I write, scholarly articles I write, blog-friendly articles that I write, you know, whatever I do, has to come back to that mission, in trying to bring forth this science and practice forward in an educational way, and in a practical way. So that’s our work at the VIA Institute. Now, one of the areas in positive psychology that I know that we’re all interested in, and squarely fits here, is the science of flourishing. And so this – you know, there’s different research camps that have defined flourishing in a number of different ways. I’ll say the most simple way, which is that flourishing is really having strong psychological well-being and strong social well-being. Of course, there’s many subpoints to both of those, but that’s the simplest way to kind of put it, so, having high well-being on these different levels. By the way, research on people in the United States shows that less than 20 percent of people in United States are flourishing. So, of course, that’s also saying that 80 percent of people in United States are languishing, going through the motions in life, not really at their best, not really performing with especially high well-being. Now, when this has been unpacked further, one of the latest theories is that there are five main well-being areas of flourishing. And so this was offered by Marty Seligman. And so, we had the acronym PERMA to describe those five areas, so P. E. R M.A – positive emotions and engagement, relationships, meaning and achievement, are each independent pathways to flourishing. Independently measured interventions can be created independently with each of them. And so scientists are studying each of these kind of collectively and individually. Of course there is overlap between them all, but they’re also distinct. So “positive emotions” is the experience of pleasure in life, and so, savoring that piece of chocolate, feeling a lot of excitement as you go on a roller coaster, you know, positive emotions, feeling a healthy pride, feeling joy in the moment, these are positive emotions. And researchers have pinned down – some researchers pin down, 10-12 emotions, and others many more than that. So that’s a whole area of study in and of itself. Engagement is kind of a buzzword in the workplace and in schools. Everything seems to be about “how do we engage people more?” and we know that people that engage more have higher productivity, and better meaning at work, and so on. So engaging in what we’re doing is engagement, being really in the flow with our work. Relationships that are positive – so what are the relationships in your life that really contribute to your well-being? Meaning is another pathway, so what are the institutions, what are the experiences that give you a sense of meaning and significance and purpose in your life? So certainly, spirituality and religion is one obvious one, you know, people that volunteer in different organizations get a sense of meaning, people can find meaning in the present moment, whatever that moment might be. So meaning is a whole robust area of study. And achievement, so achievement is another pathway for flourishing, accomplishing things, having a sense of self-efficacy about what you accomplish. The area of meaning: do you reach a sense of meaning without tapping into gratitude, without tapping into the spirituality strength, maybe it’s the strength of awe, sometimes called appreciation of beauty. So the character strengths are inherently part of these but also found as pathways. And there’s research studies supporting that across all five. Now continuing on with a little bit more on the research topic. If you go to the VIA site, so the same place you take the previous survey, you can go to where I have circled there, the research tab, and you can pull down and see 350+ studies that have been summarized in terms of character strengths across different domains, at work, in education, health, and so on. And here’s a tiny snapshot of those many hundreds of studies, that character strengths that are linked with these various outcomes. What I’m kind of finding is that almost any outcome that a person could want –better performance at work, feeling more sense of purpose in life, whatever outcome they’re looking for in their life, there’s probably a study that shows character strengths are connected to it in some way – managing stress better, improving coping, having less counterproductive work behaviors, and so on. So let me go through a couple different studies. So along the flourishing route, there was a study done in New Zealand – a representative sample of thousands of workers in New Zealand. And [it] found that those workers – and this was self-report, they reported their own observations on themselves – but those workers who reported to be very, very aware, at the highest quartile of awareness of strengths, they were nine times more likely to be flourishing than people with very, very low awareness of strengths. And those workers who were very high in strength use, saying that they use their strengths all the time at work, were 18 times more likely to be flourishing than workers who were in the lowest level of strengths use. So that tells us a couple different things. It tells us that strengths awareness is important, and strengths use is important. But it also says that strengths use really is much more important for when it comes to flourishing. Another study found, in the workplace, that using four or more of your best strengths – so if you look at your top seven signature strengths, out of the 24 character strengths – those that were using four or more of them were significantly more likely to have positive work experiences, more work that was just – a calling in their life, like, very meaningful work. So there seemed to be a cutoff of people either not using their signature strengths, or using just a couple of them, and that there seems to be something important about using a lot of your signature strengths. Which just of course makes sense, bring forth a lot of your best self into the workplace. And then even more recent study that came out last year, around looking at supervisor support for the employee’s strengths use, or a colleague-to-colleague support for strengths use. And what this study found is that it was supervisor support of their supervisees, or the employee’s strengths, that mattered most for predicting the employee using their strengths the next day. Which tells us how important it is for the supervisor to be acknowledging their supervisees’ strengths, to be reinforcing those strengths, talking about how the employee can use them more in their life, and so on. And so that, certainly – all of the stuff we can make very practical, so that really drives home for – so a rabbi who has a team, has a faculty, or administration – various people that they’re supervising – that really behooves that rabbi to be really noticing, encouraging, and reinforcing the strengths of their team, of their administration, and so on. But also, as you can see from the other studies, using a lot of your signature strengths, using your own signature strengths – it’s not just about everybody else – is very important from a scientific perspective as well. And I want to make a distinction of a character strength mindset. And so how do we think about how people change, and how we can impact people with the science of character? So there’s this metaphor of – that we can think about this – as “clay vs. seed”. So, do we think about people and our subordinates, our supervisees, do we think about them as lumps of clay to be molded, or as seeds to be kind of watered and nurtured? And so, the traditional approach to character development over the decades – used in character education programs, used in sport and athletic programs around the country, used in other countries as well – the traditional approach is the “clay” approach, that we’re going to mold everybody to be the same, so we’re going to mold everybody to have respect, responsibility, kindness, and fairness, and zest, or whatever the authority is deciding. So this is just an interesting mindset that we can think of is, how do we approach people? And when we start to get into this work with character strengths, you know, what is going to be our approach? Are we planting seeds, are we molding clay? OK, so the most important topic in, I’ll say, positive psychology, certainly in interventions, is signature strengths. So these are the strengths that are highest on the VIA survey, so those that come up in the top five, top seven, of your rank-order profile. And they have the three E’s, so they are the strengths that are most essential and core to who you are, most energizing and easy for you to use, and easiest – effortless – for you to bring them forth. And so research has been interested – researchers have been studying signature strengths now for a while, and what they found is that there’s a particular intervention that’s particularly strong. And that is to choose one of your signature strengths and use it in a new way each day. And that’s been shown to boost happiness and decrease depression for as long as six months. And what’s interesting – and this is important, as consumers of research – is that this study has been replicated many times now. You know, for good science, we don’t just want one intervention study – I mean, that tells us something – but to have many different studies, and for it to be a gold-standard study like this one, which is also what we want to look for. So it’s a randomized, double blind, placebo-controlled trial that’s been replicated across different populations and in different countries. So that tells us that we can more likely trust the findings from that particular study. So that’s exciting and good for us to be able to bring forth. Now, I’ve been particularly interested in the science around interventions and character strengths interventions. But this science is so new that we only have so many of those trials, randomized double-blind placebo-controlled trials. So in my book that came out a couple months ago, where I try to really aggregate all the best practices of the latest research and concepts in this area, and make it very practical for people, I use these seven points as a way to kind of educate people on where the intervention was at, in terms of the research. Now, this isn’t a rank order from one to seven, these are just kind of seven different points to describe the research behind that particular intervention. So is the study something that comes from a program? Is it something it comes from a theoretical concept? Is it discussed in peer reviewed journals, controlled study, but characteristics weren’t integrated in, but I integrated it in? So there’s those seven different pieces. And then I actually then took 70 character strength interventions and then offered them in eight different categories, categories of benefit that people tend to be interested in with this work. So, interventions to boost character strength awareness, or use, or meaning, better relationships, resilience and so on. And tried to make those interventions very practical, kind of step-by-step, types of interventions. Now there is, in positive psychology, something called “The Happiness Strengths,” these are the five strengths that are most correlated with happiness over and over again. But sort of another piece of advice from science is that we can only make so much of a study that’s a correlational study, where it’s showing that happiness, and in this case strengths, are co-occurring, but aren’t necessarily causing one another. So a next-level type of study is a study that, then, is measuring for cause. And so with these particular strengths, there was a study published by Rene Proyer and his colleagues in Switzerland and in Germany, that found that when you target these particular strengths with an intervention, that that actually caused an increase in happiness for people. So not only do we have the correlational support, then we now are beginning, just beginning, to get that causal, that next level of causal support with these strengths as well. So this isn’t the only way to happiness with strengths, you know, as I mentioned on the last slide here, or actually it was a couple slides ago, signature strengths is a pathway to happiness. This would be yet another pathway. I know we’re getting toward the end here – I just want to offer this as something to be thinking about, for all of us who might run meetings, or we might run a congregation, or we might do counseling for people. This is a very simple way of bringing in the science to help you with your own self-care, but also to make that meeting, that session even stronger. So I like to think of this around time orientation, before, during and after. So, before a meeting or a session, you can do what’s called “resource priming” with character strengths, and be thinking about what are your best qualities as a helper. And that’s actually been shown to boost strengths activation in the therapy context, it improves therapy outcomes. And then during a meeting, you can be pausing, even internally within yourself, and spotting the strengths you’re using, what you could be bringing forth more. After a meeting, you could be thinking back – rather than just thinking of what went wrong in the meeting and how you could have improved, which has benefits – also be thinking, doing what’s called “positive reminiscence,” which is an intervention that’s been shown to boost well-being in scientific studies. So you could do positive reminiscence on the session, thinking, you know, “what went well in that meeting I just ran for my staff?” “what went well with that meeting with that congregant?” “How did I use my strengths?”. That sort of thing. I was asked to touch on mindfulness, so let mention that. So this is one of my other books, where I try to bring the science and practice of mindfulness integrated with the science and practice of character strengths. So, summarizing the whole book in 30 seconds – I’ll say that there’s two main ways to integrate mindfulness and character strengths, is really to use each as a lens for the other. So one is to help people to get more regular with meditation, or with their mindful living, mindful eating, mindful walking practice, by infusing it with character strengths, and the other way is to use that mindful energy, to use that mindful awareness systematically, to improve your strengths use, your strengths awareness, strengths use, watching yourself from overusing your strengths, underusing your strengths, using them in the right way, when you’re offering a sermon, versus when you’re studying, versus when you’re with a colleague, versus when you’re in a job interview. You know, it’s different each time, but mindfulness is that mechanism for helping us to really use our character strengths, according to what Aristotle would call the “golden mean” of using the strengths in a balanced way. So I have an eight-week program that’s also articulated in this book in great detail, and there are some studies that are starting to support that eight-week program for managing stress and boosting wellbeing and boosting productivity. I know that you all have a technology presentation next that you guys are all offering, so in saying a little bit about how character science lays in connection with technology, obviously the VIA survey and other positive psychology instruments can be can be brought forth in a technology way, and if it wasn’t for technology, this work wouldn’t be around the world, it wouldn’t be in the hands of the six million people that have taken it, and people, practitioners and educators using it. Researchers are now becoming much more comfortable with doing online interventions studies, so we offer some of those on our site from time to time, and researchers are doing this around the world, and doing them in a high quality way – gold standard studies. We have a collaboration with Happify, which is a digital platform, very popular consumer site, that’s designed to bring positive psychology to the masses, and so they’re, kind of, one of the very very few in positive psychology that actually is able to do this. And so, you know, they are able to bring particular programs and ways of working with strengths and other topics in a gamified way, a game way, a fun way for consumers, so that’s all through technology. We’ve had a long-time relationship with eMindful, which is the leading platform with mindfulness, and so I’ve been leading mindfulness-based strength practice courses. I even lead retreats, so some of you, as rabbis, might lead spiritual retreats, which I also have led before, and really enjoyed doing. I’m finding that I can do it with success all online. Even though, of course, it’s wonderful to be in a beautiful sacred environment, but to do it online, and to create a space that way, that could still be sacred, still involve people around the world, it’s kind of an amazing thing. I’ve done maybe 10 or so online half- day retreats for people, and we do all this on the VIA Institute website or through with the VIA Institute in collaboration with organizations. So very kind of exciting. 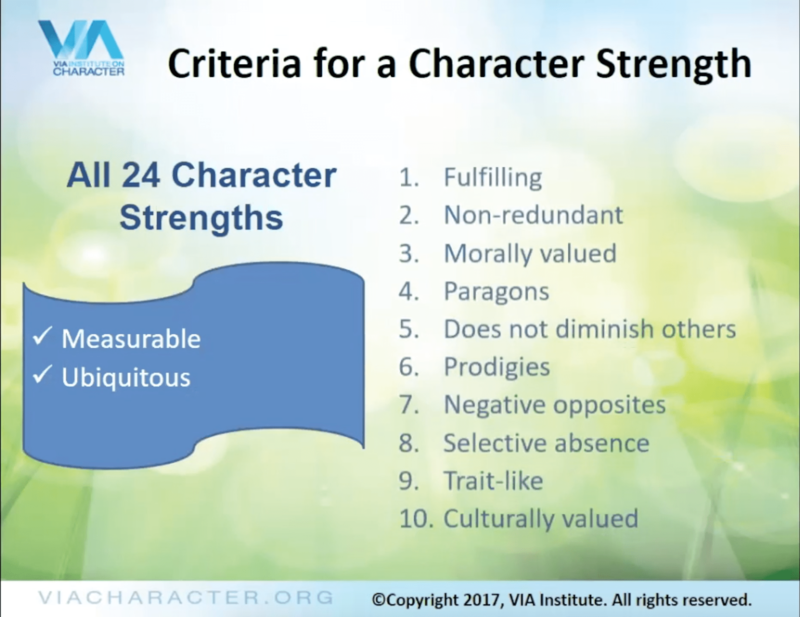 Concluding with resources – you’ve seen the VIA banner here, so you can learn more about character strengths here, you can get deeper-dive reports, you can learn about the research, so here’s kind of the benefits of technology. There’s URL’s that you can create for free on our site to manage the VIA surveys from your congregants, from your staff. There’s online courses that you can take, some are on-demand, some are live, so you can dive deeper into this science, and it’s all at that website there. So with that, I’ll pause, Geoff, and field questions. I’ll invite anybody to email me as well, so if your question doesn’t get answered or if you have something you don’t feel like asking out loud, or you need a resource, you need me to repeat something, or you need an article or a link or something like that, just feel free to let me know and I’ll be happy to help. Geoff Mitelman: Thank you so much for your time. And thank you to DoSER, and thank you to CLAL, and thank you to the John Templeton Foundation, and thank you to all of you for being part of this conversation. And we hope to see you next week, same time, same channel, we’ll send out a new link for next week, but thank you to Dr. Niemiec and thank you to all of you.